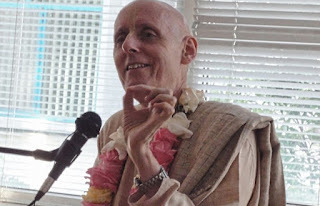 Seminar with Sankarshan das Adhikari - Jan 9, 2016 ~ The Toronto Hare Krishna Temple! One Saturday, January 9, 2016, the Toronto Hare Krishna Temple will be welcoming Sankarshan das Adhikari for a special seminar entitled, "Pure Devotional Service is for Everyone". Does that sound like a lofty unrealistic thing to you? Do you have obligations such as work and family? Do you have responsibilities? Are you struggling to maintain a regular practice of hearing, chanting, reading, and serving? If yes, come and find out how you can get on the boat to pure devotional service. The seminar will begin at 6:30pm and dinner will be served at 8:30pm. You can register for the seminar by clicking here! Sankarshan Das Adhikari appeared in this world in St. Louis, Missouri, USA on 7 November 1947. He first met his spiritual master, His Divine Grace A.C. Bhaktivedanta Swami Prabhupada, in 1971 and was initiated by him on 12 August of the same year. Srila Prabhupada personally told this new young disciple that he was pleased with his sincerity and enthusiasm for spreading the Krishna consciousness movement. Sankarshan Das fully dedicated his life for serving the order of his spiritual master to become a guru and deliver the world. For the last 43 years he has uninterruptedly served his spiritual master’s movement, the International Society for Krishna Consciousness (ISKCON), in various capacities. By the way shouldn't it be HG Sankarshan Das Adhikari? Why did kevala Bhakti Das address him directly as Sankarshan Das Adhikari? Thank you for the very good question! During recent national meetings, our GBC Bhaktimarga Swami made a presentation about the newcomer-friendliness of our presentations as temples (posters, websites, etc). He commented that those who are new to our tradition will not understand terms like "HH" (His Holiness) and "HG" His Grace, especially when they are in short form. So he encouraged that we drop the HH and HG from our public-facing write-ups. Given that our website has a lot of traffic from those who are just curious spiritual seekers, we are trying to adhere to this recommendation given by Bhaktimarga Swami. For any internal (devotee-oriented) writeups, we will always include "HH" and "HG". By the way, you will notice that there is no "HH" for recent posts about Gunagrahi Swami and Bhaktimarga Swami as well. We also are no longer using HH and HG for noting visiting guests in our temple calendar. No problem at all! Thank you for the question! Hare Krsna!